Spring is here and I am giddy about the prospects of growing my garden again. Each year is different from the last one with new plants to grow. Some have even come back since I forgot about them from last year. See my turnip left in the dirt since last Fall? And if you are a grass blade in my garden, well, you better fear for your life. You might get dug up in favor of a new garden bed. I can’t pass a garden center without taking home an orphan plant. Well, I am the luckily hostess for the Green Moms’ Spring Carnival. Many of my readers know that I am obsessed about adore gardening. Last Spring, I gave you may own sage advice about what not to do in your garden. But this year, I thought it would be great to get a different perspective from my fellow Green Moms about what Spring means to them. Let me tell you. You all are in for a treat since these women dig the Earth. Jeanne of the Green Samaritan muses about how she will be gardening on her own turf this year Although last year community gardening adventure was fun, there is comfort in gardening at home. So, readers, how do you garden? Community or at home? Do you share Jeanne’s sentiments about gardening at home? Deborah at Pure Mothers, a transplanted Californian, on the other hand talks about her adventures in gardening in her new home in England She explains in England local produce is limited and how so many of the fruits and vegetables are flown in from all over the world. With her new raised beds, she is ready to create that just picked off the vine taste she was use to in California. Good luck, Deborah with your new gardening adventure. Katherine at the Hysterical Mommy Network talks about how she is lovingly bring back her garden which was miserably left unattended for years. Despite, a previous owners disregard for the garden, old plants have revitalized themselves as if they knew it was safe to come out and thrive under Katherine’s hand. Her post resonated with me because I feel it is our responsibility to care for the land since it gives us so much in return. In fact, a little help with the picture above. I have no idea what I planted here which has come back from the dead. Katherine? Karen of the Best of Mother Earth, on the other hand is grateful to those who lovely tended her new home garden. Although she claims that she has a brown thumb, her new home has inspired her to think again about gardening. With each new daffodil, tulip, and bud she photographs, it reminds her of the potential. Karen’s pictures are wonderful. Go take a look. I especially like the one at the end of the post of Karen’s shadow. She says, “me and my shadow photographing the potential.” Karen, I know you will find that potential in your new home. Melodie of Breastfeeding Moms Unite gardens to teach her children about where their food comes from. And how do her kids feel about gardening? I am right there with your kids, Melodie. I love worms too! I bet all this gardening talk has you wondering. Can I do this ? Watch Susan of Practically Green‘s video interview of a local gardener she hired to help her select the site, size the beds, and choose the right plants to start turning her brown thumb a little greener. So, if you are thinking about a garden, Susan’s video will help you make that transition with ease. Gardening is not always who has the best toys. So after watching Susan’s video, don’t grab your purse and run out the door just yet. You don’t need to spend a lot of green to be green, especially when you are a gardener. Tiffany of Natural Moms provides a list how to be a frugal gardener. I especially love this tip of Tiffany. I am so jealous of those “Martha” gardeners! They see an empty boot, pot, or bucket and Voila! Instant gorgeous planter. Do you have the knack? Then I read Kimberley of Get Green Be Well post and thought I found my long lost gardening sister. We both love to re-use trash in the garden such as newspaper, cardboard boxes, and Styrofoam peanuts. She provides wonderful sage advice of how you can use ordinary trash items to benefit your garden. Readers, which trash item do you like the best in Kimberley’s post? So, now you have a garden and you have weeds. Diane of Green Big Purse explains how to keep weeds at bay with some environmentally friendly tricks. Plus, Diane reminds us to not sweat the little stuff. Er, weeds. Remember, weeds are only unloved flowers. Diane and I both love laying newspaper over the soil to keep the weeds from rearing their heads. I won’t spoil her post but I will say her ideas run in the category of frugal, easy, and good for the Earth. Um, be sure to not cover plants that come back and then seed themselves all over the place. Above is one of my many Kale plants which go to seed every other year and produce lots of Kale kid plants. I love Kale so the more the merrier. 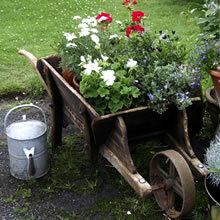 Spring is not just about gardening, it also about the old spring cleaning routine. Erin of the Green Booth provides us with tips on how to clean green with some wonderful essential oil recipes. A little vinegar and some essential oils as well as a dash of Dr. Bonner chases the winter cobwebs away. Yeck. Although Linda muses that dusting is not her favorite pastime, she provide us with advice on what to use to make dusting more effective making our environment healthier. And I know you can’t get enough. There is more! Lynn of Organic Mania must have been reading Amber’s mind when she wrote her post. She laments about her lack of a brown thumb, but offers advice on how to buy green gardening supplies. Lynn explains it is important to buy organic seed since they are not genetically modified. Why? And while you are shopping , Lynn recommends you buy plants in pot that are not made out of plastic since plastic does not degrade in a landfill or compost. Finally, Lisa of Retro Housewife Goes Green shares with us the downside of Spring. Allergies. How many of you sneeze and blow the entire season? My oldest has terrible spring allergies. Lisa offers wonderful natural suggestions to help you ease your symptons. I especially like Lisa’s suggestion on using a neti-pot to break up congestion. Whew! Readers, don’t these ladies know how to inspire! So, let me know how Spring has invaded your household and/or how these posts will inspired you to create a new Spring routine? Now, if you excuse me, you know where I am heading. My kids and husband plants are calling me. Anna – you are totally the perfect host for this conversation!! .-= mother earth aka karen hanrahan´s last blog ..Never Clean Soap Scum Again! =-. Hey, thanks for the nice intro and link. .-= Micaela´s last blog ..Getting Kids in the Garden =-. I SOOO miss being able to garden… or have time to blog for that matter. Thank you for giving me a sprig of spring. Thanks so much for putting this together. I’m off to read the posts now, it looks we have a lot of great ones this time around! Thanks for being such a great host, off to read all the posts! .-= Lisa @Retro Housewife Goes Green´s last blog ..Happy Earth Day Celebration Week! =-. Well, I reposted the photo http://hystericalmommynetwork......arge-here/ and got some interesting responses. “I tried to guess but the angle and the focus made it hard to do so. Can you get a side shot? I am a vegetable nerd, so while I may be of limited help in this situation, I would like to issue a public announcement – Ladies and Gentlemen, its 3 weeks until its time to start your overwintering brussels sprouts. Do you know where your seeds and warming trays are?” This one makes me laugh. “Well, I LOVE a good plant identification game . . . especially since Patricia and I just returned this evening from a lovely spring hike over in Umtanum Canyon during which she identified the birds and I identified the plants/flowers. This photo, however, just doesn’t give me enough clues. First of all, I have no idea where on the continent we are. Give me a couple of clues, and I bet I can tell you what we’re looking at. But, then again, sometimes I have a pretty big head . . . I think the fern/weed comment may be on to something. Do keep us posted. Now I’m really curious. .-= Katherine´s last blog ..Redesigned =-. .-= Kim´s last blog ..Stylish and Eco-Friendly Naya Shoes =-.